President Trump continues to fire shots at the press, claiming biased coverage, misrepresented facts, and sometimes entirely made-up stories. 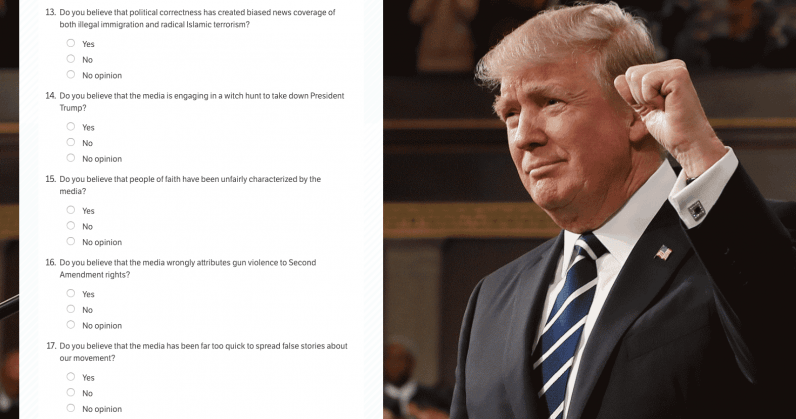 In what can only be described as a war on traditional media, Trump continued his assault with a poll on media bias that, ironically, might be the most biased line of questioning this reporter has ever laid eyes on. The line of questioning would also suggest that this is less a poll and more an attempt to ignite Trump’s base in a push for reelection in 2020. If you had doubts, the call to action should put your fears to rest. “The Fake News Media is out to get us,” it reads. “This is a fight we can’t afford to lose. Please contribute to FIGHT BACK.” Contributions, conveniently, are set to $100 by default. The poll starts innocently enough, with questions one through nine being the sort of standard boilerplate you’d expect on most surveys of this nature. The trouble starts on question 10, with problematic wording. “Do you believe that the mainstream media does not do their due diligence fact-checking before publishing stories on the Trump administration?”. This is commonly referred to as “response bias,” or a “leading question,” specifically. A standard poll would ask the question in its simplest form to avoid confusion or leading respondents to a desired answer — which ruins gathered data by imparting bias in the responses. In this case, the only way to ask this question without imparting bias, is: “Do you believe the mainstream media does their due diligence in fact-checking before publishing stories on the Trump administration?”. Conveniently, this is also the simplest way to ask said question. Granted, that’s assuming the dataset hasn’t already been skewed by the non-neutral polling ground. In polls, where you ask the questions matters almost as much as the question itself. In this case, we can forego any notion of neutrality due to the place where the questions are being asked: a republican presidential candidate’s fundraising site. For conservatives, it’s the same idea as a Second Amendment poll appearing at CNN.com. The results certainly aren’t going to convey the will of the American people, just those that visit CNN, an audience that skews heavily liberal. If a neutral survey was the intention, better options exist. WhiteHouse.gov, would be a great choice, as would a third-party, non-partisan polling operation like Pew Research. But it’s clear that a neutral survey isn’t, nor has it ever been, the intention. Question 12 is equally problematic: “Were you aware that a poll was released revealing that a majority of Americans actually supported our temporary restriction executive order?”. This is true, but it’s also true that the majority of polling data showed Americans were opposed to the so-called Muslim ban. A Politico/Morning Consult poll showed clear support for the executive order. Others, like polls from the Associated Press, CBS News, Quinnipiac University, Gallup, and CNN/ORC show overwhelmingly that the ban was unpopular among respondents. And this is just picking a handful; polling data on this topic is all over the place. Why? Because wording matters. A Rasmussen Reports poll that found strong support for the immigration freeze was worded this way: “Do you favor or oppose a temporary block on visas prohibiting residents of Syria, Iraq, Iran, Libya, Somalia, Sudan, and Yemen from entering the United States until the federal government improves its ability to screen out potential terrorists from coming here?”. Contrast that with the Quinnipiac poll, which asked: “Do you support or oppose suspending all travel by citizens of Iraq, Syria, Iran, Libya, Somalia, Sudan, and Yemen to the US for 90 days?”. See the problem? The question is worded in a way that makes those who oppose the move feel as if they are enabling terrorists unfettered access to their neighborhood. In reality, the answer is far more nuanced than the question. This actually leads us to our next problem, nuance. Support or oppose are too broad to give a clear indication of public opinion. Quinnipiac, for example, split the single question into three, asking specifically about a temporary freeze on immigration from the seven nations, a temporary hiatus to allowing refugees into the country, and a permanent prohibition on allowing refugees from war-torn places like Syria. Results showed that a simple yes or no to a single question would never prove to be a clear indication on sentiment; respondents were in favor of parts, while opposed to others. Respondents opposed the temporary ban on immigrants from the seven listed nations, while supporting a temporary refugee ban (until better systems were in place to vet them), and ending the Syrian refugee program entirely. Again, nuance. I mean… how? PC culture generally dictates that you don’t make sweeping assumptions based on race or nationality, and that you aren’t using incorrect (and often racist, sexist, or homophobic) terms in referring to them. I don’t see how this affects coverage. But I digress, on to the next point. Question 14: “Do you believe that the media is engaging in a witch hunt to take down President Trump?”. You can’t just ask if you think the media is treating Trump fairly, or if “mainstream media has unfairly reported on our presidency” like the polls second question asks? Even that’s a fairly problematic wording, but we’ll take it over a second pass at the same question with even more pointed wording than the first. Question 15: “Do you believe that people of faith have been unfairly characterized by the media?”. Which faith? Muslims? Christians? Other? I could continue, but honestly I’m exhausted, and you’re all smart people. I’m sure you get the idea. This poll is clearly going to give Trump’s campaign the results they’re looking for, and I’m certainly going to request the unmodified dataset using the Freedom of Information Act (FOIA). We’ll analyze the results together if the government grants my FOIA request before I reach retirement age. Fingers crossed.